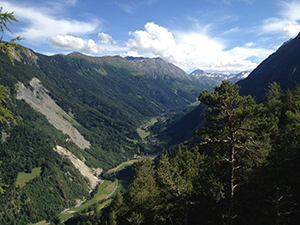 Home / Blog / FAQ: when can I walk to the Great St Bernard Pass? 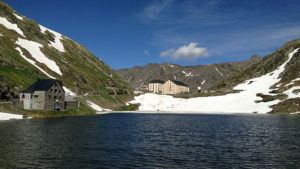 FAQ: when can I walk to the Great St Bernard Pass? The Great St Bernard Pass, Col du Grand Saint-Bernard in French, is roughly the half-way point on the pilgrim’s journey on the Via Francigena, the Camino to Rome. Located in the heart of the Swiss Alps, the Great St Bernard Pass connects Martigny, in the canton of Valais in Switzerland, with the Aosta Valley in Italy. At 2473 metres, it is the most challenging stretch of the Francigena pilgrim route and a traditional stop for pilgrims. Proof of this is the Hospice du Grand Saint-Bernard. Located at the pass, the hostel was founded in the 11th century by Saint Bernard d’Aoste and has been hosting travellers and Francigena pilgrims since. A bigger hotel was built in the 20th century to help accommodate visitors. The pass is one of the oldest in the Alps and also gives name to the famous St Bernard rescue dogs, one of the most endearing symbols of Switzerland. However, the road to the pass is only open in the Summer, approximately from mid-June until mid-September, although this can change depending on snow fall and weather each year (some years it might open earlier and remain open until early October). Bear this in mind if you are planning to walk or cycle this section of the Via Francigena from Lausanne to Aosta via the Great St Bernard Pass; we recommend you book that section for the Summer months. Also remember weather in the Alps can be cold at night, even during the Summer months, so make sure you pack warm clothes. You might encounter snow even during the Summer. For more information about the Via Francigena or to book your trip, contact our travel specialists.